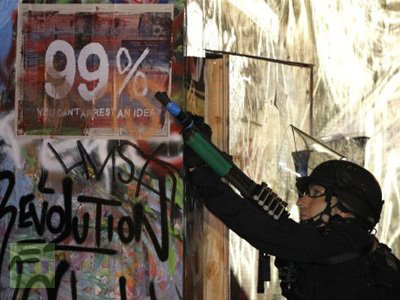 The ongoing anti-greed Occupy protests have seen too many instances of police using brutal tactics against demonstrators. Some says the US is militarizing its police force and squashing the very freedoms it is so keen to preach internationally. In recent months, US police officers have made an enemy out of those citizens using their freedom of speech to protest against corporate greed and corrupt politics, reports RT’s Marina Portnaya. 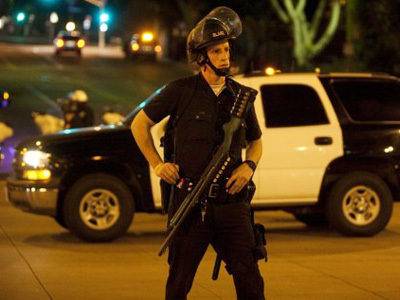 Today’s breed of law enforcers are dressed in riot gear and armed with heavy weaponry, body armor, flash bangs, tear gas, and potentially lethal projectiles. 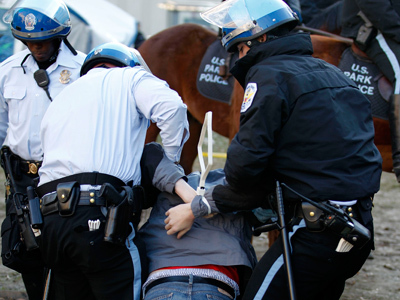 As tens of thousands of Americans assemble, cops have been accused of creating confrontation, not defusing it. Some veterans of the force can’t help but resent the situation. “It’s a travesty of democracy, the way the police are totally suppressing the people’s right to assemble and to protest. I joined the force to protect people’s rights to assemble and protest, not to squash them,” said Ray Lewis, retired Philadelphia police captain. And America’s military veterans have a similar opinion. “There is no honor in this! 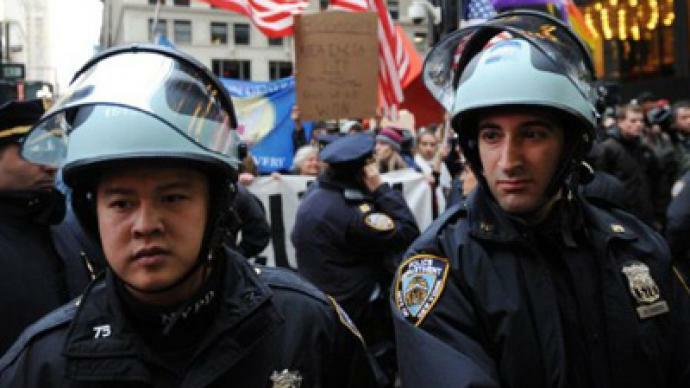 If you want to go fight, go to Iraq and Afghanistan!” shouted US Marine Sergeant and Iraq veteran Shamar Thomas as he rebuked policemen for targeting Occupy New York protesters. 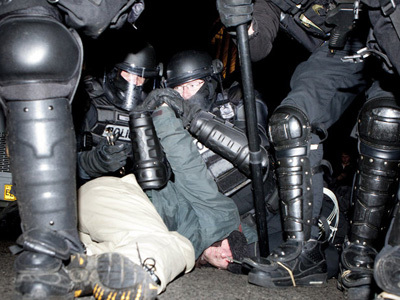 In Oakland, war veteran Scott Olsen, who survived two tours in Iraq, was seriously injured by local police officers using flash grenade canisters against Occupy protesters. The 24-year-old was hospitalized with serious head injuries. In Seattle, the oldest victim of the police-turned-paramilitary was an 84-year-old activist temporarily blinded by pepper spray. The United States, which bills itself the pillar of international law and democratic freedoms, has consistently placed itself on the world stage as a self-appointed beacon of moral authority. But while lecturing Iran or Libya on how they should deal with their protests, the American government does not seem to meet the same standard at home. Today, the very people employed to protect Americans leave thousands with bruised bodies, eyes burned with pepper spray, locked behind bars, tasting their own blood. As dissent in the US grows louder, many say Washington’s glass house of hypocrisy has shown beautiful symmetry. "They want people to be able to have freedom of speech but they don't want that freedom to interfere with them in any way. To be in any way disruptive or challenging to them,” believes Alex Vitale, Associate Sociology Professor at Brooklyn College. The line that traditionally separated us soldiers from civilian law enforcement has arguably been erased, and replaced by what is being dubbed the American militarization of police tactics – tactics that reflect cracks in the founding principles of American democracy and human rights. Incidentally, the same principals the US continues to lecture all other countries about.